Installing transmission by lifting - Thug life at its peak! Installing transmission by lifting – Thug life at its peak! Installing transmission without using a transmission jack for some is next to impossible. Well, the guy in the video says otherwise. Those of you who have never installed a transmission should now that are in a luck. Installing transmission is requires a certain amount of preciseness and the transmission itself is huge, heavy and dirty. The reason why that particular job could be considered dreadful is because you should place the transmission in the center right underneath the car. It all seems easy and logical but, the practice is not as delightful. Well, I can go on all day about what I find annoying about it but, it seems that someone can do it in no more than 5 seconds. Moreover, this guy in the video is that someone. Installing a transmission requires a transmission jack unless your the guy in the video. 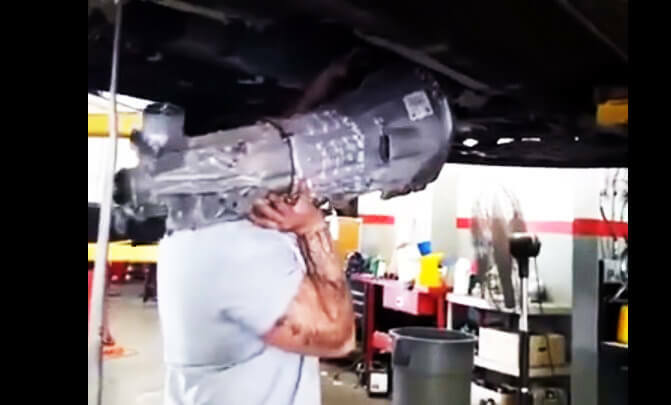 He doesn’t seem to have a problem lifting the transmission itself right into position. In addition, he does it all by himself. Now, you may have heard stories about how old school is lifting a transmission and putting it in p;ace. Nevertheless, back in the old day, they haven’t installed them in a standing position! The Installing transmission that you’ll see in the video below may not be full of gears. We don’t know that for sure but, what we do know is that the output shaft on it is pretty heavy. Installing transmission video below! 1969 Pontiac GTO pays tribute to the GTO Judge – The JUDGEMENTAL! This Can Come In Handy – Pressurized Running Water on Jeep Wrangler JK! 2015 Suzuki GSXR Roadster Spondon 1.0 by Custom Wolf!! “Elemment Palazzo”, the most expensive and most luxurious RV ever!